Every so often a bass-fishing technique comes along that's amazingly simply, yet absolutely deadly when properly executed. Such is the case with the float n fly, the most innovative method for catching bass in clear, cold water to surface in years. I first heard about the Float n fly system back in the early 90’s. 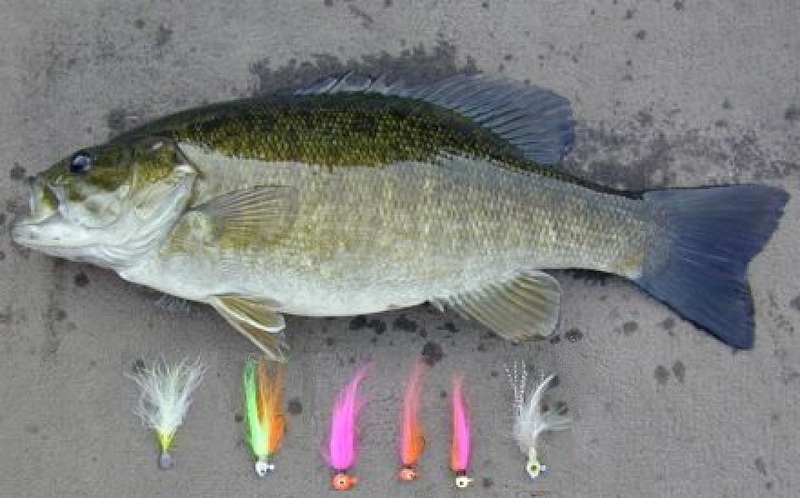 While it's especially potent on Smallmouth’s, it will catch Largemouth as well. 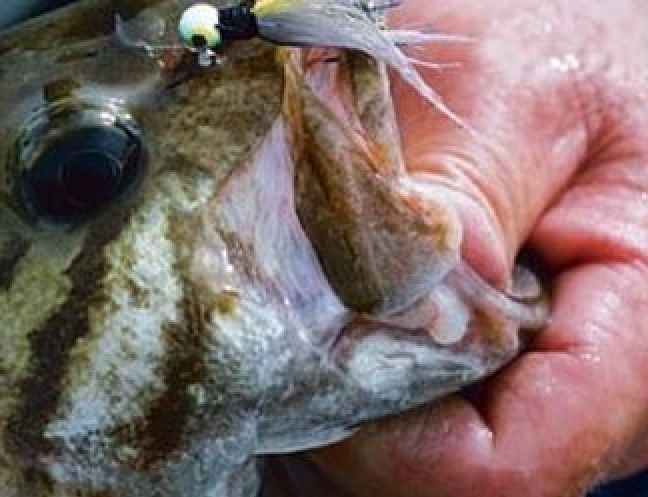 And because it works better than almost any other technique in chilly winter waters, it will extend your bass-fishing season by weeks, if not months. I don't hang up my rods or put my bass boat in storage till the bitter end as I can normally find fish to catch almost all winter. I fish Smallies and Pike all winter long and if you try out this float n fly technique so can you. Thus the float n fly was born. The float n fly is basically a slip bobber on light line with a small marabou or hair jig tied on. You put a bobber stopper on just above the height the fish are down in the water column and just the wave action is normally enough to trigger a strike. Although some guys prefer to fish super light jigs, like 1/32 or 1/16 oz. under a stationary float, but I like a somewhat larger ¼ oz or 3/8oz. hair jig under a slip bobber, as it can be fished deeper if needed. I do use 1/8 oz. jigs sometimes as well. I fish these on an 8 ft. med/lite action spinning rod with a size 20 or 30 spinning reel spooled with 4 to 6 lb mono or 6 to 8 lb fluorocarbon line. A 5+ pound smallmouth hooked on light line is a guarantee for heart attack! But, the light line is necessary for casting the float n fly and allowing the fly to drop quickly beneath the float. Anglers must learn to be delicate when fighting big fish on this light tackle. Usually, smallmouth will take the fly out in open water away from cover, so they don't hang up very often. All you have to do is stay connected to them until they wear out. This may take awhile as you can't horse 'em. You give line when they want to run, then you take it back when you can. Otherwise, you just let the long limber rod do its job. The main things are to be patient and keep the fish from wrapping around anything. I prefer using a landing net rather then lipping them in cold water as you can land the fish quicker and it doesn’t get as stressed as well as keeps you hands warmer. The float 'n' fly method is most effective in clear water with a temperature between 38 and 48 degrees. 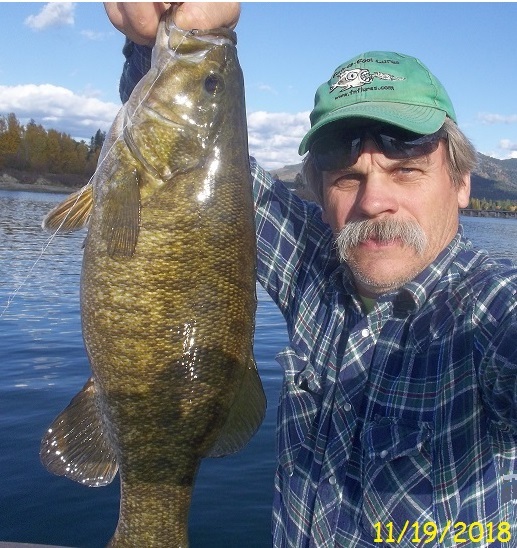 It absolutely shines when the water is in the low 40-degree range, a period when many smallmouth anglers have traditionally hung up their rods. I got two surprises when I first began using the float 'n' fly in midwinter. I was amazed at the number of fish I caught, and I was even more stunned by the fact that even larger smallies will go after those tiny jigs. As even 4 pound Smallmouth’s are not un-common with this method." When the water is extremely cold, suspending bass are in a totally neutral mood. Their metabolism is slows down so low and their digestion process so sluggish, they don't feed very often. But they will strike a tiny natural looking hair jig is dangled right in their face. •	Open water in "hollows" (deep, narrow, V-shaped tributary arms). The most 'catchable' bass will be hanging eight to fifteen feet below the surface." Just make sure you fishing above the level of the suspending bass and not below them. I fish both hair jigs and marabou jigs, and both catch fish. The marabou offers a better color selection though. I like mainly ¼ oz white, white and chartreuse, Firetiger, pink, orange flame, and chartreuse colors for my fly’s and I like this bobber. As it lays flat on the water till a fish hits and it will stand up telling you quicker that you have a strike. Then I cast the rig to the target area. I like to either work the rig back to the boat with short twitches of the rod tip, or if the water is choppy just let it sit there and let the wave action subtly work the bobber and fly. Slower is better because bass are likely to be sluggish and won't chase a fly. As with most fishing techniques the float 'n' fly method works better some days than others. On windy, overcast days, smallies tend to suspend shallower and are highly susceptible to this technique. The bite often gets tougher when the sun comes out and fish go deeper; that's when it's better to target shady bluffs or windy banks. Dead-calm, sunny days also are bad; try setting the float as high above the fly as you can cast it, or look for dingy water where the fish are likely to be shallower. Any day is a good day to go fish as long as it is warm enough your reel and guides won’t freeze up and you can keep somewhat warm. I like to take a little buddy heater along with me on colder days and have a good supply of pocket hand warmers on hand. A major part of the fun of using the float 'n' fly system is that it might take five minutes to land a lunker on that soft-action rod and wispy line. But then, what else do you have to do on a cold winter day? You've done a really good job with all your articles, and I have leaned something new with each one. Don't know if I'll get out in this cold weather, but if I do, I will try this. Thanks! Hey JF, Glad to hear you like my articles and learn something new with each one. That's my goal is to teach guys better ways of catching fish, practice good sportsmanship, and fish handling techniques.